After a couple of weeks of whippy price action and volatile movements in throughput lamb and sheep markets settled down a bit this week, broadly speaking. Although, some bigger moves were noted for mutton in South and Western Australia. 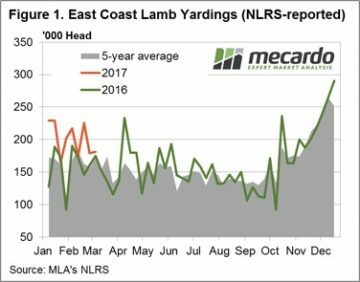 Figure 1 highlights the recent pattern of east coast lamb throughput showing a much more subdued pattern this week, in contrast to the seesaw of the weeks prior. 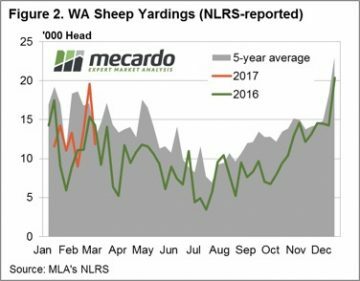 Yarding figures hardly budging with a meagre 1.4% rise to sneak above 181,000 head. The Eastern States Trade Lamb Indicator (ESTLI) responding to the stable throughput settling exactly where is closed this time last week at 611¢/kg cwt. Stability in price the order of the day for most categories of lamb in the national indicators too with 0-1% gains in all classes of lamb, except national restocker lambs, down 3% to $96 per head. Equally stable price movements for most of the state based categories of lamb with many posting a 0-3% gain. Victorian restocker lambs, SA light lambs and WA light lambs the exceptions – down 5% ($106 per head), up 11% (570¢/kg cwt) and down 5% (601¢/kg cwt), respectively. National mutton slightly softer on the week, down 2% to 412¢ – dragged lower by SA mutton which reported a 13% fall to 381¢. In contrast, WA mutton experiencing a stellar performance with an 11% price rise to 478¢/kg cwt. Spurred on by much softer supply (as shown in figure 2) with WA mutton throughput down 39.6%. 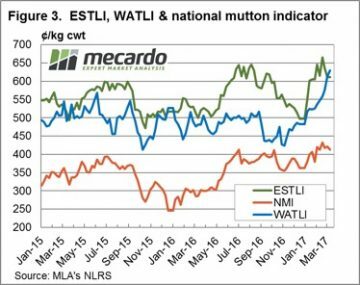 The impressive performance this season not limited to mutton in the west with the Western Australian Trade Lamb Indicator (WATLI) continuing to press higher this week to close at 629¢ – figure 3. The tighter season and firm export demand helping support WATLI and WA mutton, 31% and 78% higher than this time last year – respectively. Forecast rainfall between 5-15 mm to much of the sheep bearing regions of the nation next week will give slight relief to the recent dry spell to much of SA and Western Victoria during the last fortnight. This is likely to encourage further price consolidation to continue for the next few weeks for lamb and sheep markets.